Have you unknowingly been lured into New Age mystical practices by teachers claiming that certain “new ways to pray” will bring you closer to God? Have you signed up for classes in Spiritual Formation? Have you been involved in Centering Prayer , Contemplative Prayer, or Lectio Divina ? Well, this new series of posts in the new Category of posts that I have entitled, ‘MYSTICISM MONDAYS‘ will attempt to peel back the layers of spiritual deception and present you with the truth of God’s Word that will expose the dangers of these practices. Lord willing, at least once a month on a Monday, I will be sharing teachings with you from Christian experts on the subject, some of whom have even been personally involved with these dangerous practices. All of these teachings that I will be presenting to you will focus on many Scriptures; those who speak on these topics will not just be talking about these practices, because it’s only the truth of God’s Word that will expose the dangers of these practices and set a deceived person free. 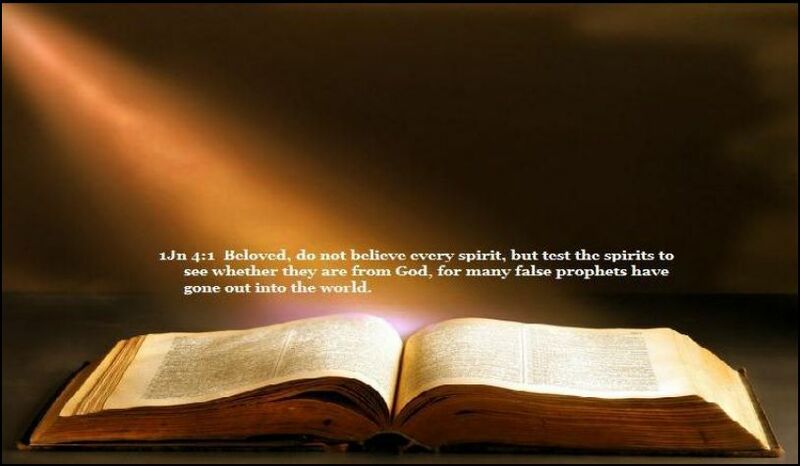 Please test the teachings of all those whom you listen to against Scripture as God’s Word shows us that we are to do (Acts 17:11) so that you will never be deceived. Below you will find a video Playlist in which you will hear another one of my favorite speakers, Roger Oakland, of UNDERSTAND THE TIMES. In his presentation he will clearly show you how there is a One World Religion for peace forming and how there is a plan to win the world to the Roman Catholic Jesus –the Eucharistic Christ. If you are a former Catholic like I am, you will understand who/what this Eucharistic Christ is. If not, your eyes will soon be opened to discover how many Christians are being led astray by this Eucharistic Christ because not only are they failing to test things in light of Scripture, but also they are falling for the popular deceptive teachings that cause Christians to seek after having mystical experiences with God above seeking to know God through His Word. In the following presentation, Roger Oakland shares many articles and documented evidence in order to show you how these mystical practices that are being promoted in many churches today (via the Emerging/Emergent Church through Spiritual Formation, Lectio Divina, Contemplative Prayer, etc. ), are being used to entice Evangelical Christians to travel down the road of mysticism which leads to Rome. Oftentimes, when Christians involve themselves in these mystical practices that began with Catholic monks, known as the desert fathers, it causes them to embrace Roman Catholicism itself, which is the goal of the New Evangelization program of Roman Catholicism. Watching Roger Oakland’s videos concerning Roman Catholicism and Another Jesus made me see the connection with the Manifest Presence of God that is the focus of the messages of some popular pastors and teachers today, with what is called the Real Presence in Catholicism, and how these two could easily merge together one day. We must be aware of Church History and, above all, what God’s Word teaches, so that we will not be deceived, because, as you well know, history often repeats itself. Do you know God’s Word well enough so that you will not be deceived by these false, mystical teachings that are being promoted in many Christian churches today claiming to lead you into having a deeper and more intimate relationship with Jesus Christ? Are you seeking to know God through His Word? Or will you sadly be among those who are being led astray today because you have fallen for the lie that God’s Word is not enough, and that you can now have experiences with God? When time allows, I hope and pray that you will watch Roger Oakland’s presentation so that you will become aware of yet another way in which mysticism is being used these days to cause Christians to seek after having experiences with God, and lead them away from Biblical truth that can be found in God’s Word alone. Are you aware of the teachings of Catholicism and how they compare to Scripture? It is extremely important for you to know, not only because these mystical practices that are being promoted today are rooted in the teachings of Catholic mystics, but also because of the fact that Catholicism teaches “another Jesus” and “another gospel,” and many Christians are being led astray by their teachings. Do you know God’s Word well enough so that you could lovingly and patiently share the good news of the gospel with a precious Catholic if the opportunity arises? Lord willing, I hope to have my post completed by the end of November in which I will compare many of the teachings that can be found in the Catechism of the Catholic Church against the truth of God’s Word. I hope that you will consider checking back here towards the end of next month and learn how to discern truth from error when it comes to Catholicism. Until then, please read and study God’s Word and continue to test all that you read and listen to against the truth of God’s Word so that you will not be among the many Christians who are being deceived today.